I am a sucker for anything about WWI or WWII and women! This book totally caught my eye from the title alone and I knew instantly that I had to read it! Julie Summers has written a lot on the subject of women and WWII especially (I have my eye on one of her other books, Fashion on the Ration, as well!) 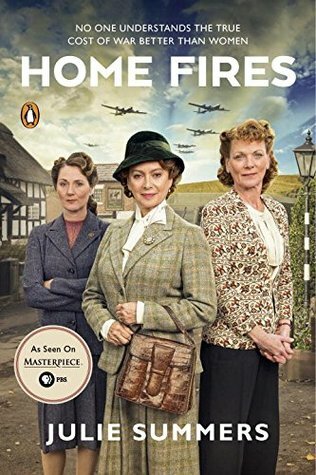 and her book Jambusters (AKA Home Fires) was the inspiration for the new PBS series Home Fires. This book focuses on what was happening at home while the boys were away a war. In towns and villages across Great Britain, ordinary women were playing a vital role in their country s war effort. Summers focuses her research on the Women’s Institute which was an organization the ran canteens, knitted garments, and collected herbs to replace medicines. They advised the government on issues such as evacuation housing, children’s health, and reconstructed. Not every woman was cut out for war and battlefield nursing so what did they do? Well they made jam! Ironically, even though these women helped with vital, important work in their communities, they were perhaps best known for making jam. These women produced jam that they created from start to finish all of which went to feed a hungry nation. “Home Fires,” Summers’s fascinating social history of the Women s Institute during the war (when its members included the future Queen Elizabeth II along with her mother and grandmother), provides the remarkable and inspiring true story behind the upcoming PBS Masterpiece series that will be sure to delight fans of “Call the Midwife “and “Foyle’s War.” Through archival material and interviews with current and former Women s Institute members, “Home Fires “gives us an intimate look at life on the home front during World War II. This book was absolutely wonderful! I have lately been so focused on things like Nursing in the Civil War (all part of my History MA) that I haven’t read a lot about women in other wars or other parts of the world and what they contributed. This book, though non-fiction, did not read like a non-fiction academic book. While Summers provided lots of historic research in her narrative, it wasn’t ‘boring’ by any means. These women were an inspiration. They literally were the most tenacious, resourceful, and enduring women that I’ve read about. It really opened my eyes to aspects of the war that I didn’t really give much thought to. For me, the interest is often women on the battle field, that I forget about the behind the scenes women and what they were able to contribute. I found Summer’s writing to be excellent and her research was extensive and impressive. I think this book would be a wonderful read for academics as well as ‘arm chair’ academics. It’s not so thick with history and scholarly references that it would put the average reader to sleep, but it has enough well research material to satisfy academics too. Her passion for the subject was evident and I was thrilled to read about such a unique group of inspiring women! Well, well done! I highly recommend this book. For me personally, I was more interested in the personal, individual stories of the women rather than the overall history but I think that combining both was brilliant and offered a lot in the way of variety for women’s history fans. As I mentioned before, I am excited to read some of Summer’s other works as I was extremely impressed with her writing and her research skills as well as her topic choices so bring on more books by Summers! I am also excited to watch the PBS show too, I love stuff like this and set in that period…..plus PBS does such a great job with period pieces that I simply must watch this show!